Adrian Martinez dives for a first down. Scott Frost served notice at Big Ten Media Days. Eight teams stepped up and took their shot, five of them beating Nebraska by less than a touchdown during Frost’s maiden voyage at his alma mater. A lost-turned-found-season finished on a bittersweet note on Black Friday, with a courageous fourth quarter rally that came up just short. Yet at the end, it’s evident the groundwork is laid for a surge in Cornhusker stock. Nebraska went into the Iowa game without one of their most dangerous weapons, JD Spielman, playing only for pride and momentum. Despite losing 31-28 on a 41-yard field goal on the game’s final play, the Huskers walked away with both. Is it possible to lose eight games and still carry a healthy dose of momentum and optimism into the off-season? This year, it is. Despite a lot of mistakes and inefficiency while learning new systems on both offense and defense, the Huskers regained a no-quit fighting spirit in Year One of the Frost era. Nebraska ends the 2018 season on the rise, with players learning to adapt to their coaches new system, and coaches learning to adapt to a new conference. We found out that Frost’s fast-paced offense can be effective if it gets enough opportunities. And there lies the difficulty. Frost and his staff have come face to face with timeless Big Ten truth. To beat the Wisconsins and Iowas year in and year out, they’ll need to do a better job of running the ball and stopping the run. Either that, or force twice as many turnovers as they did this season. How quickly and effectively will defensive coordinator Erik Chinander and his staff process what they learned on their first trip through their new conference? In the end, an old familiar problem did in the Huskers. Too many times, their defense just couldn’t get off the field when it needed to. Iowa converted seven of 13 third downs and went two-for-three on fourth down. Frost observed that Iowa’s game plan was to keep the ball away from Nebraska’s offense as much as possible. The Hawkeyes carried out their simple strategy well, holding the ball for nearly 35 minutes. “Those games drive me crazy as a play-caller, because you stand on the sideline for what seems like hours at a time,” Frost said. Frost and Chinander are going to have to find a way to overcome that old-school strategy, because they’ll be seeing that script a lot in upcoming years. You can only beat a team like that by smashing it in the mouth. NU’s rushing game and run defense were not up to the challenge. NU could manage only 140 yards rushing on 33 carries while allowing the Hawkeyes 266 rushing yards on 45 tries. On passing downs, sophomore tackles Brendan Jaimes and Matt Farniok were overmatched, unable to handle their pass blocking assignments much of the first half, which led to three Adrian Martinez sacks. But let’s lay aside the question of style —Nebraska flat-out needs quicker, stronger linemen, both on offense and defense. And a couple more fast, tough linebackers would help a lot, too. That would get the Huskers to a respectable level. At times, Chinander’s defense looked almost helpless against the simple stretch plays and counters that Kirk Ferentz’s Iowa teams have run for 20 years. The three interior Husker defensive linemen were blown off the ball more often than not. That lack of physicality is the biggest thing Nebraska needs to fix this off-season. In his postgame press conference, Frost seemed confident that another year of Zach Duval’s strength and conditioning program will go a long way toward solving that problem. Then again, Iowa played exactly the kind of game it wanted to, and had the Huskers on the ropes, leading 28-13 and had a first down at the Nebraska 11-yard line with about five minutes left in the third quarter. When Mekhi Sargent ran seven yards to the 4, the Husker defense looked gassed, and appeared ready to cave in. They had no business making it a tense game in the final minutes, but to their credit, that’s exactly what they did. The Huskers didn’t get the good start they wanted. They played from behind all day, as they did for much of this season. And yet they found a way to take the game down to the final snap. 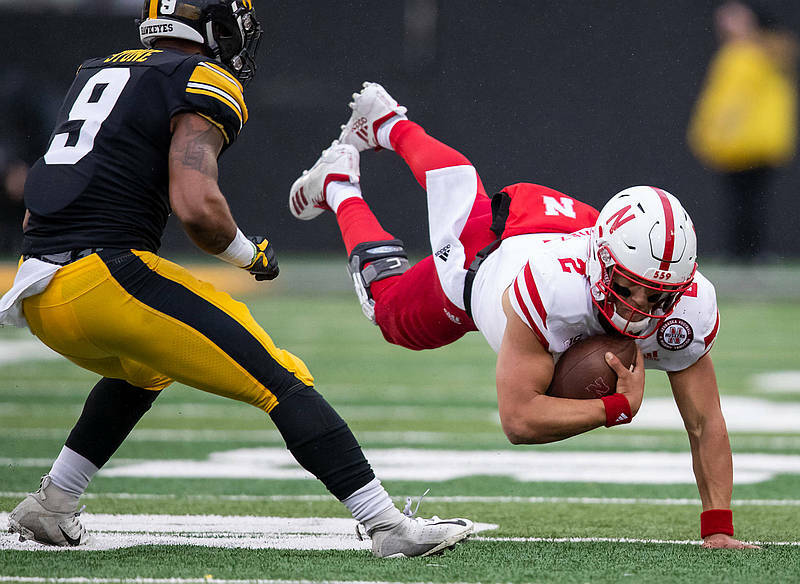 Two big special-teams plays by senior Luke Gifford inside Nebraska’s 10-yard line flipped the script, giving Martinez and the offense a final chance to make a comeback. With the help of fellow freshman Maurice Washington, Martinez stunned the Iowa crowd by leading two touchdown drives in the fourth quarter, and using his feet to keep a two-point conversion play alive, hitting Kade Warner with an impressive two-point conversion pass in the back of the end zone to tie the game 28-28 with 3:22 remaining. But that was the last time Martinez would touch the ball. So ends an erratic ride that gave Husker Nation tantalizing glimpses of the future, mixed with large, sobering helpings of the present. The odds were against Frost and his team in Year One, when they faced a steep learning curve against a daunting road schedule. Yet Frost’s 4-8 season feels worlds away from Mike Riley’s 4-8 death march. Nebraska is a proud program with a bright future, which is miles ahead of where it was a year ago.